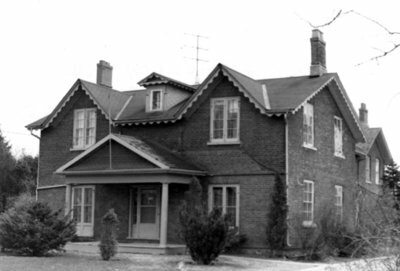 Black and white photograph of the front of 601 Dundas Street East. This house was built in the 1850s and was the home of James Holden and his wife until 1883. In the 1950s to the 1970s it was the residence of Norman George and his wife. The house was demolished in the summer of 1980. 601 Dundas St. E., Brian Winter, 1974. Whitby Archives 17-006-003.